The HF-3300 is a 100-300 kV TEM/STEM/SEM powered by Hitachi's state-of-the-art cold field emission technology for high-brightness and high-energy resolution. Capabilities needed for daily material structural characterizations and analysis are provided. Unique electron optical designs include spatially resolved EELS and double biprism electron holography. The simultaneous secondary electron imaging and STEM imaging reveal surface and bulk structures at the same time. A special version for gas environmental TEM or aberration-corrected microscopy is available. The 300 kV HF-3300 TEM/STEM combines cold field emission gun (CFEG) technology pioneered by Hitachi with innovative functions such as parallel nanobeam electron diffraction, spatially-resolved EELS, and double-biprism electron holography. The superior energy resolution and beam current density of the CFEG obviates the need for a monochromator for high energy resolution spectroscopy. High coherence and brightness of the CFEG together with the double-biprism electron holography make the HF-3300 the best electron holography instrument for your laboratory. The comprehensive imaging modes of the HF-3300 produce an ideal tool for high resolution and analytical materials science. TEM, STEM (BF, HAADF), SEM (at 300 kV or lower), EDX/EELS spectroscopic imaging, and electron holography imaging, as well as high sensitivity high energy resolution EDX and EELS provide both structural and chemical information for materials study. 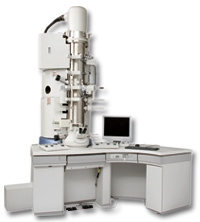 In addition, the HF-3300 has special configurations for in-situ environmental TEM. Sharing HF-3300 specimen holders with Hitachi FIB systems (NB5000, FB2200) make sample preparation and TEM study a highly efficient data pipeline.